eComm Conference :: International Portfolio :: PRO IT Service S.R.L. - Choose a professional and accessible service for your online image! Lee Dryburgh from eComm Media, Inc wanted to have us develop his www.ecommmedia.com project, but as we were very busy with other large projects, we couldn't engage on his other project. Anyway, a few months later, Lee came again to us and asked me to do a clone of his project and keep it as an emergency copy within one of our servers. The job done for Lee Dryburgh from eComm Media consisted on the Emerging Communications Conference Web site backup and installation on one of our Web server as a rescue copy in case of any emergency. 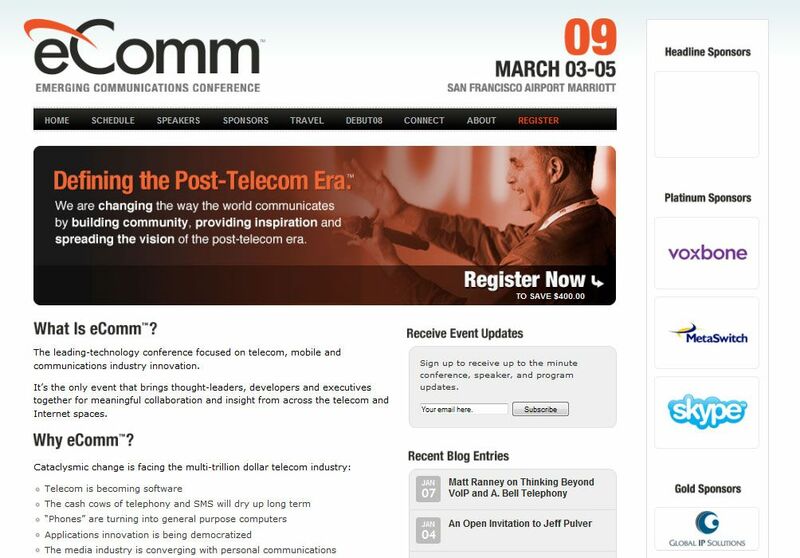 On November the 9th, 2007 I've got an email message from Lee Dryburgh, Founder of eComm Media Inc and SS7 Networks Limited, and Person-to-Person Communications Technologist asking for developing the www.ecommmedia.com conference Web site which at that moment was in the project phase. At that time I was in London, U.K. with business at some of my new media partners, including Shiny Media Ltd. I've been very busy at that time of the year; a lot of wonderful work, my birthday on November the 8th and the upcoming Le Web 3 Conference from Paris. Furthermore, In London I was using a slow T-Mobile wireless internet connection (didn't expect to run such a bad service in London, not far from the London Bridge). Anyway, I had to tell Lee that I won't be able to get that contract at that time. Later, in February 2008, Lee came back asking this time to clone his movable type development executed with another contractor and host it under one of my companies servers rented from Pair Networks Inc. This work, in technical terms involved cloning his entire Web site, configuring another domain for it under one of our web servers from Pair Networks and then making sure the site works fully independently from the official release. The idea Lee had was to make sure he has a working copy of his Web site available elsewhere so that in case his Web site will be hacked or anything else that may happen, we could be able to immediately invite his visitors to go to this other domain where his web site clone was available. In order to make this emergency backup really useful, Lee and I established a routine which to include refreshing the rescue copy every at a specific frequency so that the updates from the official release are ported to the backup server. As this work was very satisfactory for Lee on hosing the eComm 2008 conference, Lee decided to engage us also on doing the exact same service for the eComm 2009 conference. During this collaboration, Lee engaged me also for some movable type work on his project, mainly related to implementing a few other features etc. The rescue movable type implementation we've worked on proven as an excellent development support for implementing extra features on the official release. So basically, we've been doing some work on the installation hosted on our server and then ported this work on the official release and so, made it available to the public. Since the work done for eComm Media didn't include any design work, I would limit to only showing you the main page capture. 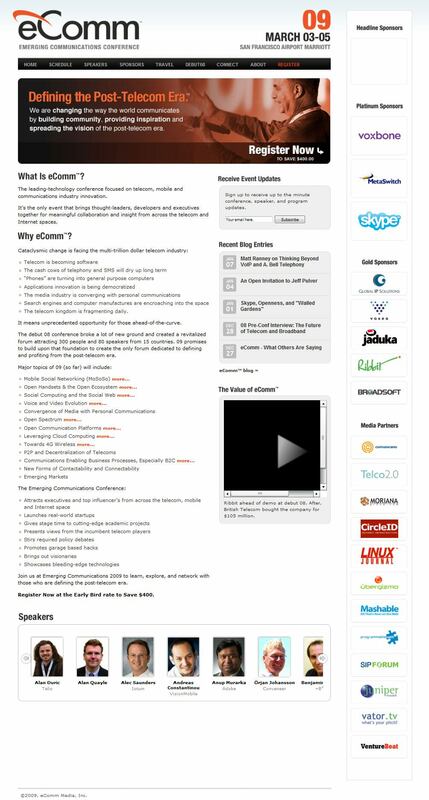 To see the Web site in action, you may like to go to www.ecommconf.com. Contracting from eComm Media Inc, Oakland, California, U.S.A.